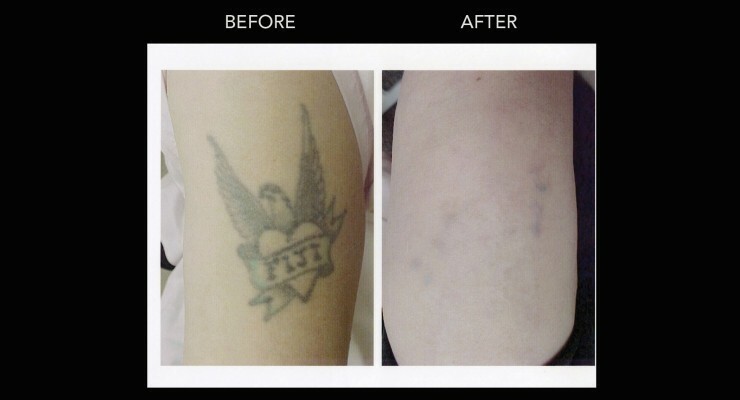 Our laser tattoo removal treatments utilize the gentlest techniques for the most comfortable experience possible. Our high quality, gold-standard lasers are capable of effectively removing tattoos and dyes that could not be treated with older technology. Ask about our Alexandrite Laser, capable of removing dark greens and blues. 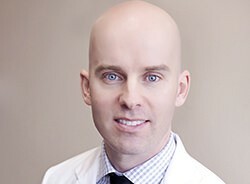 DermMedica is owned by Dr. Craig Crippen, an M.D. certified to perform cosmetic laser procedures by the American Board of Laser Surgery. We have been performing these treatments safely, and in a relaxing environment, for more than 20 years. One of the lasers we have for Laser Tattoo Removal is the Fotona QX MAX – The Highest power available today in a Q-Switched laser. We also have two other tattoo lasers including a Cynosure Accolade 755nm and a Hoya Con Bio Medlite laser which are both excellent lasers for tattoo & pigment reduction. Some other brand names of tattoo/pigment lasers you may have heard about include both the Picoway and Picosure lasers (not currently available). Most people don’t know what actually makes up the ink that is deposited in the skin when they get a tattoo. Some of the inks are made of run of the mill chemicals while others like red ink contain mercurial sulphide. Black Iron Oxide (Fe3O4)Iron Oxide (FeO) Carbon Logwood Black ink is made from magnetite crystals, jet, wustite, bone black, and carbon. These pigments are often used in India ink. Brown Ochre Ochre contains iron oxide and clay. In its raw form ochre is yellow in colour. After being heat treated it changes to a brown-red colour. Red Cinnabar (HgS) Cadmium Red (CdSe) Iron Oxide (Fe2O3) Napthol-AS pigment Rust or iron oxide is reddish in colour and often used to make red ink. Cinnabar is the ore form of mercury. Both cinnabar and cadmium can be toxic and result in skin reactions. Naphthol Red is a synthetic pigment. It is less toxic and lower risk than other forms of red pigment. Orange disazodiarylide and/or disazopyrazolonecadmium seleno-sulfide Orange pigments are made by condensing two mono-azo pigments. They are fairly stable and can be difficult to remove. Flesh Ochres To make flesh tones many pigments are combined. It can be difficult to predict how easy they will be to remove with a laser. Yellow Cadmium Yellow (CdS, CdZnS) Ochres Curcuma Yellow Chrome Yellow (PbCrO4, often mixed with PbS) Disazodiarylide Tumeric and curcurmin are used to make curcuma. Yellow pigments may contain cadmium. This can be a cause of allergic reactions. In order to obtain a bright yellow effect more pigment is often used with yellows. Green Chromium Oxide (Cr2O3), called Casalis Green or Anadomis GreenMalachite [Cu2(CO3)(OH)2]Ferrocyanides and Ferricyanides Lead chromate Monoazo pigmentCu/Al phthalocyanineCu phthalocyanine Green ink usually contains a variety of pigments including yellow, red and Prussian Blue. Blue Azure Blue Cobalt Blue Cu-phthalocyanine Cooper salt-based blue pigments are the safest. They are often used in kids products and contact lenses. Other blues are made with azurite, lapis lazuli, cobalt aluminum oxides and chromium oxides. Violet Manganese Violet (manganese ammonium pyrophosphate) Various aluminum salts Quinacridone Dioxazine/carbazole Purple pigments vary in how stable they are. Some are photoreactive and lose colour after being exposed to light. Others like dioxazine and carbazole are more stable. White Lead White (Lead Carbonate) Titanium dioxide (TiO2) Barium Sulfate (BaSO4) Zinc Oxide White pigments can either be used alone or to change the colour of other pigments. They can be unpredictable to remove and sometimes become darker or turn black with laser treatment. With use of a special laser, we can break apart very small ink particles in the skin. Over time, this ink will be taken away by your own body. Lasers are the only way to remove tattoos without causing scarring to the skin. The number of treatments varies depending on the size and colour of a tattoo. It can take anywhere from one to a dozen laser sessions to remove a tattoo. Coloured tattoos are more difficult to remove and typically require additional treatments. Each tattoo is different depending on the ink used, how deep the ink is in the skin, and how long an individual has had the tattoo. Will the tattoo be 100% gone? It is not always possible to fully eliminate every tattoo. We always try to remove as much of the tattoo as possible during each session and over the course of treatment. Some patients opt to just lighten their tattoo for a more desirable cover-up piece of art. Does your laser tattoo removal hurt? We use medical anesthetic to completely numb the treatment area. As a result, very little to no discomfort is to be expected. As a medical facility, we can perform this procedure so you have no discomfort during your laser session. Without anesthetic, the treatment is very uncomfortable, more so than having the tattoo put on in the first place. Just ask anyone who has had a laser tattoo removal session without freezing! Does tattoo removal leave scarring? 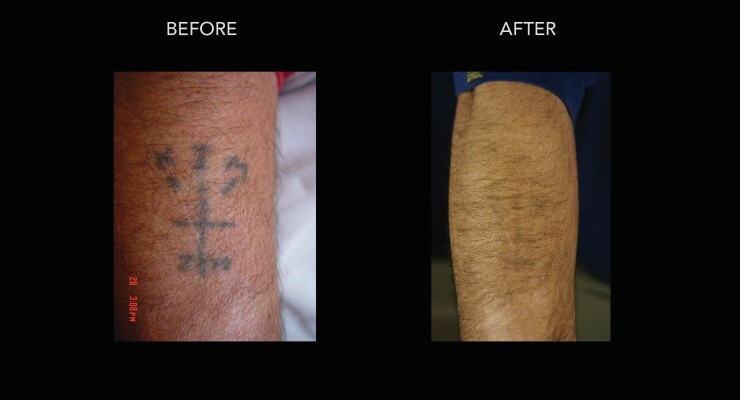 Occasionally laser tattoo removal can cause scarring or whitened areas of the skin. 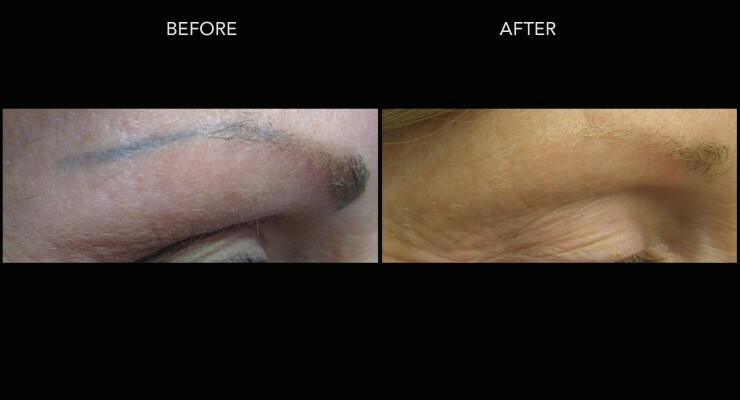 This is due to a combination of the ink used and the amount of treatments needed for complete removal. 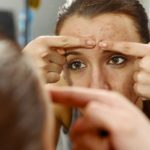 Scarring can also be caused by individuals who have little knowledge or experience in this procedure. Is it easier to remove a new tattoo or an old one? This is a common question from our laser tattoo removal patients. What we have found is that if the tattoo is brand new (within a few weeks), it does seem to respond better to laser therapy than if it is older than that. Ideally, if you have a tattoo you dislike from the outset and you want it removed, don’t wait long to do so because you’re only prolonging the number of laser removal sessions. We have treated tattoos as new as a few hours old, and some that have been on a person for over fifty years. There is quite a bit that we can do for tattoos of every age. What should I do if I’m interested in having a tattoo removed? 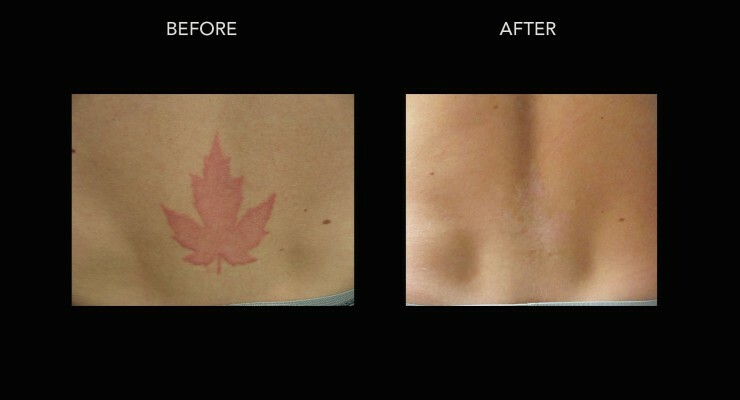 If you are interested in laser tattoo removal in Kelowna please call us (250-868-3070) or book a consultation online. We always need to see the tattoo in person to give you an accurate assessment and quote. Will skin with tattoos removed look like the skin around the tattoos? Or will it be lighter or darker in shade? 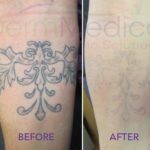 Normally after laser tattoo removal, the skin that has had a tattoo removed looks a bit lighter in colour compared to the surrounding skin. Your skin colour also plays a role in this. If you have darker skin, the skin can be much lighter than normal for you. Generally most of the skin pigment returns in 6-12 months, but this can sometimes be unpredictable. Can I choose sedation for any laser treatments? Laser tattoo removal is a procedure where we use very intense light energy to destroy and break up ink particles in the skin. This procedure is uncomfortable and patients will experience pain. There is no way around this, however, for some tattoos we can use local freezing injections (just like we would if stitching a cut) so that you will feel nothing during the treatment. This isn’t feasible for very large tattoos or on certain areas of the body. 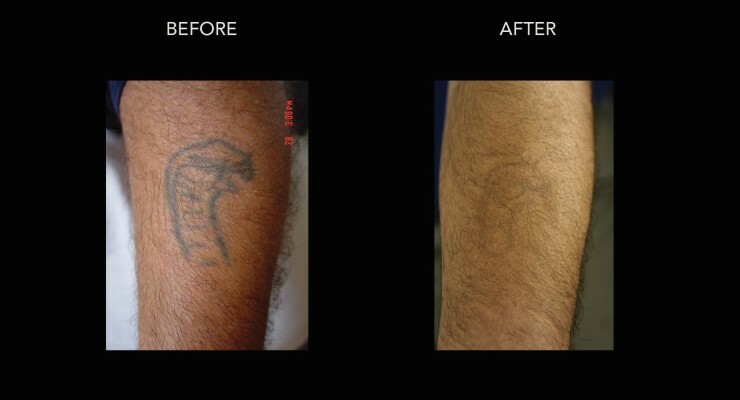 Sedation is not typically performed for laser tattoo removal due to the risks involved. 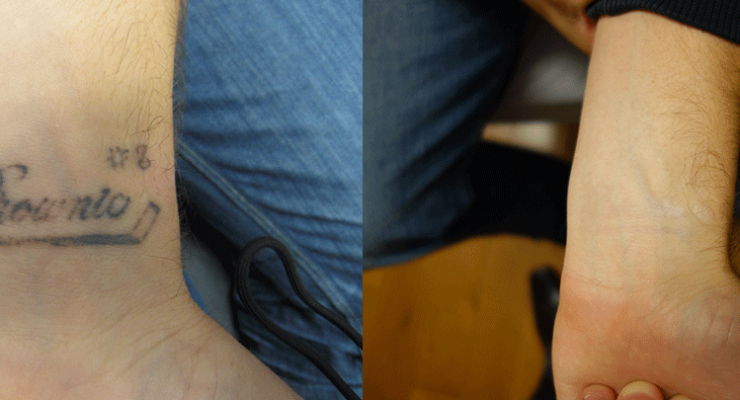 Is the tattoo removal laser precise enough to remove only parts of tattoos? This is a common question we get for laser tattoo removal because some patients only want certain areas of the tattoo lightened or removed because they want to redo that area again with another artist. The laser can be fairly precise but the spot size of the light beam is usually no less than 4mm in diameter. You would need to see the laser physician in consultation to know if this would work in your specific situation.